Much of my information came from online sources (listed below) and the book pictured here, Anthony Slide’s Eccentrics of Comedy. Originally, my plan had been to thrill you all with a quick one-two punch, er, I mean series, of El Brendel-related posts. That is, until my plans were waylaid by an uncooperative fact that involved a few days of research… but I’m getting ahead of myself. There’s nowhere else to begin but at the beginning. Elmer Goodfellow Brendel was born March 25, 1891, in Philadelphia, PA. Louie of the fabulous El-focused blog Give Me The Good Old Days! has a terrific run down of El’s first years and of his family. Both that post and the entire blog are highly recommended. When I first heard of El Brendel many years ago on the Usenet group alt.movies.silent, I thought El Brendel was a Latin name which meant something like “The Silly Person.” Imagine my relief when I discovered “El” was short for “Elmer”. Contrary to his famous stage and screen persona, Brendel did not come from a Swedish family; his father was German and his mother was Irish, and Brendel spoke with with no descernable accent. 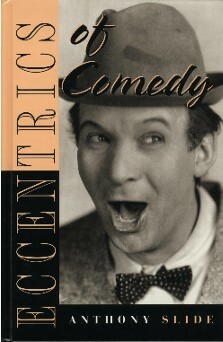 In 1913 Brendel started in vaudeville as a German dialect comedian. However, because of anti-German sentiment during WWI, he changed his shtick to a faux Swedish accent. This characterization became known as “The Simple Swede” and, by all accounts, was a success. His trademark accent routinely swapped a “y” sound for “j”, which lead to his most famous catchphrase, “yumpin’ yiminy!” This catchphrase is occasionally used to this day, and is probably more recognizable than the original “jumpin’ jiminy” it was based on. The best I can tell, Brendel was responsible for the creation and popularity of “yumpin’ yiminy”, although few nowadays know where the phrase originated. 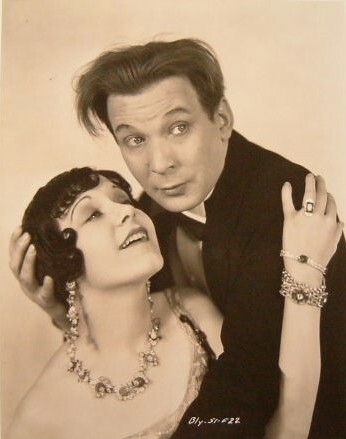 By the late teens, Brendel was playing larger shows in vaudeville and on Broadway, often with his future wife Sophie “Flo” Bert. Brendel and Bert were married in 1924 after partnering on stage for several years. Bert was in some well-known Broadway productions in the teens and early 20s, and recorded many popular songs of the day. One of Bert and Brendel’s biggest stage hits was “Cinderella on Broadway” in 1920. There are a few online reviews and notices of other shows, such as “Over Here” from 1918 and “The Mimic World”, which played in 1921. The New York Times’ archive of the August 18, 1921 review states that Brendel played a “Swedish youth of possibilities”, a role which “coaxed an occasional gaggle”. Otherwise, the “dreary” play fell flat, and “all was silence”. El began acting in movies in 1926 when he signed with Famous Players-Lasky. He made several films in 1926 alone, the first being “The Campus Flirt” (1926), which was released just two days before his next film “You Never Know Women” hit the theaters. His first major role was in the 1927 classic “Wings,” where he plays the comic relief character Herman Schwimpf. And it’s here where things got kind of sticky. I have a copy of the film “Wings” and El’s character is, indeed, Herman Schwimpf, a mild-mannered German-American who runs into trouble when trying to enlist for World War I. His patriotism is questioned because of his heritage, but he always proves himself by revealing an American flag tattoo on his arm. Schwimpf joins the U.S. Signal Corps (which later became the Air Force) the same day Jack and David do. Although he flunks out of the Corps, he becomes a mechanic and is stationed at the same base Jack and David are. Anthony Slide’s book, however, makes a large point of stating that Brendel’s character was an Irishman named “Patrick O’Brien”. I thought that was odd, as Slide is an excellent historian and it’s unlikely he’d make such a mistake. What was even odder was that many online sources agreed with Slide, most notably the “Wings” commentary on Silents Are Golden and the “Wings” entry on the Progressive Silent Film List. The fact is, though, that it is indeed a mistake, perhaps originating with programs for the movie that erroneously list Brendel’s character as “Patrick O’Brien”. Why the programs printed in 1927 for the film’s release have the wrong character name, though, is as yet unexplained. It is not the result of a re-cut or last minute change. Rodney Sauer, member of the Mont Alto Motion Picture Orchestra, confirmed on alt.movies.silent that his copy of the original score for “Wings” refers to Brendel’s character as “Herman”. This score was used on the night of the premier, so the character was obviously Herman and not Patrick from the very first day the film showed. Daniela on the same group was kind enough to point out that the German word for “dishonor” is “schimpf”, which is extremely close to Herman’s last name. Although I was unable to find the reason for this incorrect character name, I am still looking into it, and would love to unearth more promotional material for “Wings” to see how many mistakenly list Brendel’s character as Patrick O’Brien rather than Schwimpf. One day I hope to be able to tell you the mystery is solved. Brendel was allegedly unhappy with his small roles in films, including “Wings”, where he claimed much of his work wound up on the cutting room floor. Personally, I find that an odd thing to say, as his role in “Wings” was significant. 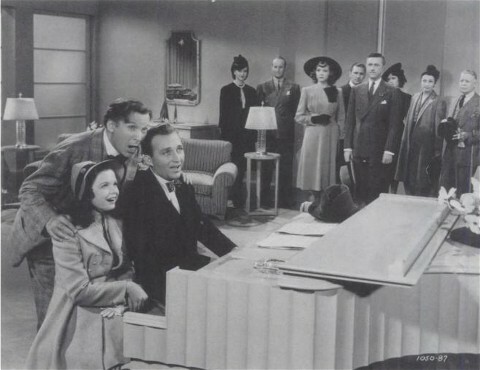 Regardless of whether his complaints were valid or not, Brendel left Famous Players-Lasky and went to Fox just in time for talkies, especially musicals. Between 1929 and 1931, Brendel was featured in most of Fox’s major releases, including “Sunny Side Up” and the sadly lost “New Movietone Follies of 1930”. 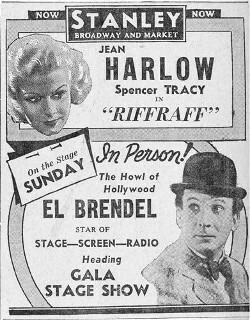 In the 1940s Brendel found himself getting smaller parts in feature films, but starring roles in a series of Columbia Pictures two-reel comedies. Nearly 20 of these were produced, although most were “some of the worst produced by a major Hollywood studio.” A few shorts were quite good and one, “Blitzkiss” (1941), was nominated for an Academy Award. In this series of shorts Brendel was first paired with Tom Kennedy, and when that didn’t work out, he was paired with Elsie Ames as a “scatterbrained former eccentric dancer”. 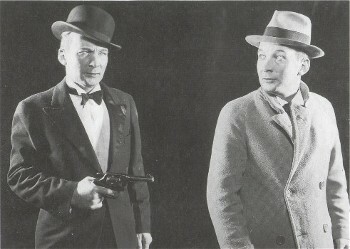 When that pairing didn’t pan out, Brendel went solo, but by 1945 he was paired with Harry Langdon. The Langdon shorts are notable only for being the last pictures Langdon ever made. Many of these shorts were remade into Three Stooges shorts which were much better received by audiences and critics. 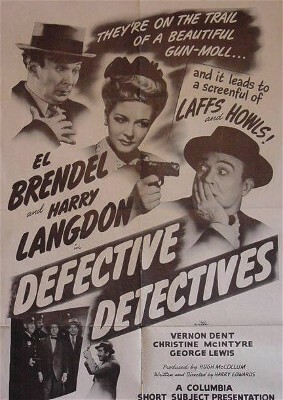 His career on a steady slope downward, Brendel received some unexpected help from director Preston Sturges in 1949. Sturges gave Brendel a featured role in “The Beautiful Blonde from Bashful Bend”, but the film flopped and it didn’t lead to better roles for Brendel. El’s final film, “The She-Creature” (1956), is a sci-fi Z-grade cult classic which has been featured on “Mystery Science Theater 3000”. It will be featured on this blog, too. Brendel’s wife Flo Bert also has a small part in the film. In the 1950s and 60s, Brendel had a few small parts in television shows, but for the most part he had disappeared completely. He died of a heart attack in April, 1964. You’ll notice that I’ve made it this far without mentioning once that El Brendel is almost universally loathed. When I first joined alt.movies.silent, El Brendel was mentioned only in sarcastic tones or in-jokes. As I began to delve deeper into the silent and early talkie/pre-code era of American films, I discovered a tangible, visceral hatred of the guy lurked just below the surface of the film community. Brendel has been described, in more charitable moments, as “inescapable” and “history’s most irritating comedian”. Richard Barrios seems to have a specific hatred for the little fellow. As much as I like Brendel, I have to confess that his comedy can get really old really quickly. It’s stale vaudevillian shtick reminiscent of Zoidberg’s uncle Harold Zoid in that “Futurama” episode nobody likes. Brendel’s Swedish characterizations were unflattering and occasionally racist. But it’s a mistake to judge an early 20th century comedian entirely with our 21st century sensibilities. It’s impossible for us to completely step outside our own culture, yet we should in some capacity try to understand the culture that, for a brief moment, made El Brendel the most famous comedian in America. i wonder if FLO BERT is a play on FLAUBERT? Ha! It could be, since “Flo” is a nickname. I believe her real first name is Sophie. There were Swedish dialect comedians (and Swedish accents!) long before Brendel. No idea whether they used the phrase “yumping yiminy” though. I’m aware that exaggerating the switch of the “j” with a “y” is common. I certainly wasn’t saying El Brendel was the only person who ever spoke with that accent, I was trying to say that “yumpin’ yimminy” — which wasn’t popular until the 1920s and after — is still referenced today, even though “jumpin’ jimminy” isn’t a popular phrase at all. If it’s confusing, I’ll clarify. I have to edit the post for an unrelated issue anyway. I haven’t seen all of Brendel’s Columbia shorts, but the one I would recommend highly is Love at First Fright (1941)–definitely the creme de la creme of his two-reeler output for the Lady with the Torch. It seems unlikely that El Brendel shorts will be released on DVD. The reason is due to the Three Stooges popularity. It seems that El Brendel shorts will remain in Columbia vaults, permanently.